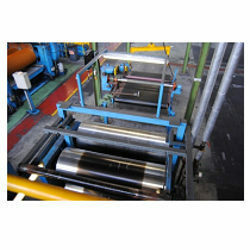 Providing you the best range of used four roll calender machine with effective & timely delivery. Our expert sourcing brings to you this very good quality Used Four Roll calender that is utilized for rolling out thin natural rubber films, coating of tyre cord and manufacture of conveyor belt blanks. The given machine is available in different specifications to meet the varying needs of the customers. This machine is produced using best quality parts and propelled innovation under the supervision of experts. Our valuable customers can get this item from us at very reasonable prices. Roll dimensions 1650mm wide x 700mm dia. Adjustable guides to top nip and lower nip. Full unidrive gearbox with flexible couplings to each roll. fully variable roll speed and friction. Closed loop water cooling system (+ steam inlet). Complete with all controls etc and in very good condition. Looking for Used Four Roll Calenders ?